Join us on the first night of Southern Decadence, Thursday, August 30th, for a late summer event in our Tricentennial Lecture Series! 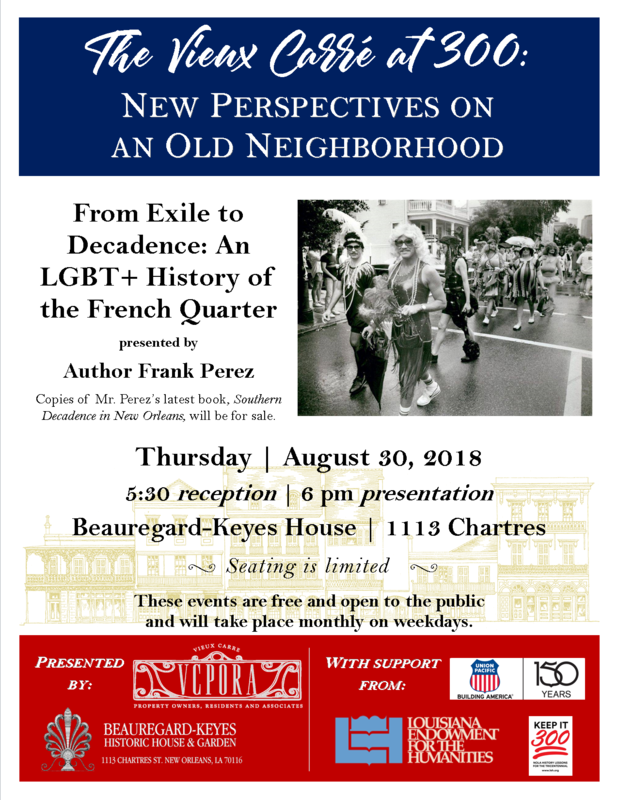 Author Frank Perez will present, From Exile to Decadence: An LGBT+ History of the French Quarter. These events are free and open to the public, but seating is limited. To guarantee a seat, please email Lily at lily@bkhouse.org. In addition to serving as the President of the LGBT+ Archives Project of Louisiana, Frank Perez is a writer, historian, educator, public speaker, small-business owner, and tour guide. He has authored three books: In Exile: The History and Lore Surrounding New Orleans Gay Culture and Its Oldest Gay Bar (with Jeffrey Palmquist), Treasures of the Vieux Carre: Ten Self-Guided Walking Tours of the French Quarter, and Southern Decadence in New Orleans (with Howard P. Smith). He lives in the French Quarter.